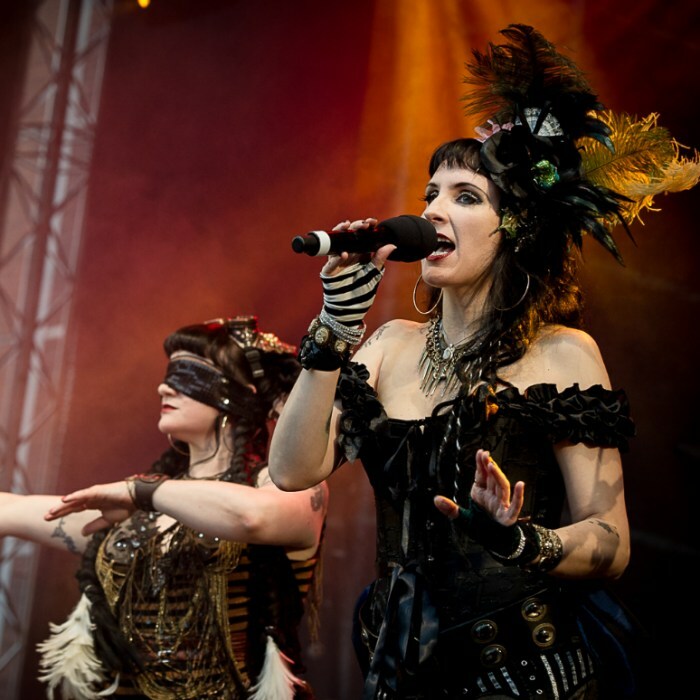 Violet is a band from Germany formed in 1996 who describe their style as "medieval crossover", combining medieval instruments with female vocals, drums, and synthesizers. Their website can be found at http://www.violet-net.de. A year after releasing “The Book Of Eden”, the successful soundtrack to Kai Meyer’s best selling book “Das Buch von Eden”, Violet now present their fourth studio album “Modern Life”. Again, the six musicians have combined historic influences with innovative impulse. At the same time, “Modern Life” is a great deal more energetic than its predecessor: bagpipes, dulcimer and cembalo have learned to groove. VIOLET have become more eclectic. Rock-orientated dynamics (“Exult”, Modern Life”, “Home”) meet catchy pop (“White”, “Read My Lips”), while psychedelic leanings (“Oda a Francisco Solinas”), innovative arrangements (“Come Closer To The Fire”, “Ponderoso Caballero”), melancholic vibes (“I Wonder Why”) and the typical diversity of sound guarantees the variety and suspense fans have come to expect from the band. Most of the tracks are sung in English; two songs in Spanish carry on from the critically acclaimed album “Omnis Mundi”. Since 1999, VIOLET are renowned in the German Gothic, Independent and Medieval scene and have recorded three albums; their medieval acoustic project VIOLETTA has brought them additional acclaim. Violet broadened their musical horizon by collaborating with other bands such as HOUSE OF USHER (for instance on “Radio Cornwall”), projects that helped to consolidate their characteristic sound. The band has played live in Germany and also in a number of other European countries and often shared a stage with renowned acts like L’Âme Immoretelle, Corvus Corax, Faun, Saltatio Mortis, Persephone and many others. They often enhance their live shows with oriental dance elements. For their live presentation of “The Book Of Eden”, VIOLET also realised a elaborate stage show with the theatre company KixTheater, directed by theatre pedagogue Andrea Kixmöller with whom the band would like to work again in the near future.